Genny's World: Bead Soup Party Reveal Day! Here's what I was sent! Reveal Day 2014 for Bead Soup Party Blog! My earlier posts explained what the party is about and who my partner is in this wonderful, exciting adventure into bead design. Again my partner is: Evie and Beth McCord. Please check out their blog. You will get such a treat! Their imagination along with their beautiful lampwork beads and enameled pieces give such a unique twist to their Soup pieces. What a thrill! Here's my piece being worked on! Humming Bird on my Shoulder! I tried for an asymmetrical piece (a real challenge for me!) I could not have asked for better beads and focal to work with! I love chainmaille so I did a Double Vision Weave along with a Two by Two weave to fill in the spaces. The bracelet. 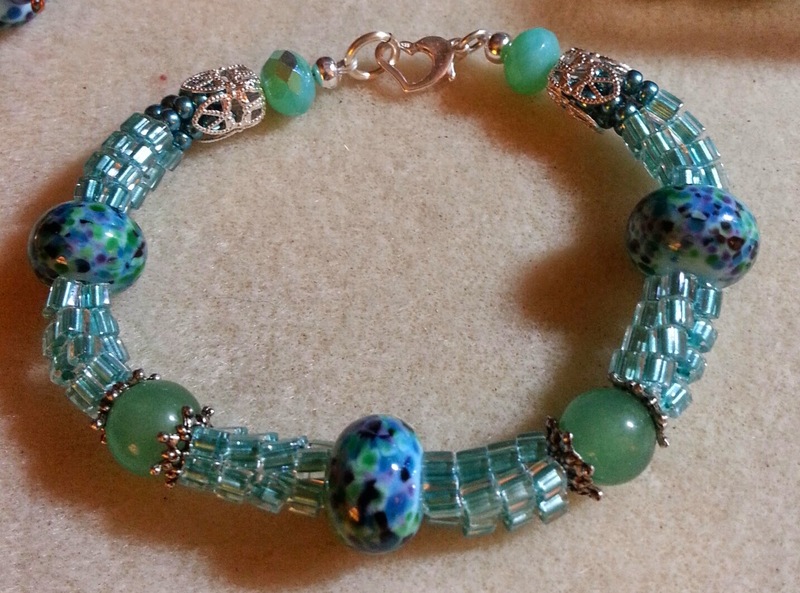 I used the blue/green lampwork beads in combo with some chalcedony beads along with some nicely hued 3mm cubes. The stitch is Herringbone, I used a sterling silver heart lobster claw clasp. The earrings. 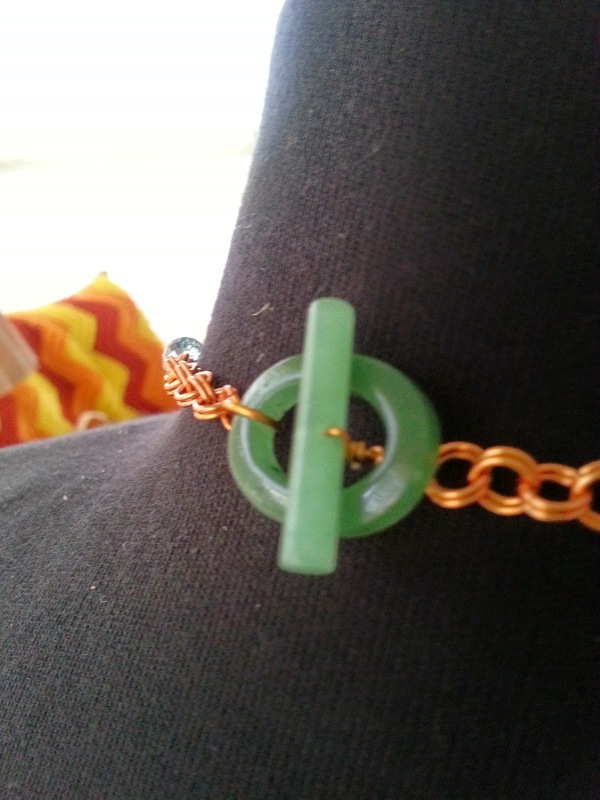 I fashioned my own earwires. I have a free tutorial for these on my website. So far the only time I've used the beautiful orange lampwork beads is to grace the top of my latest projects, my copper folded autumn leaves! 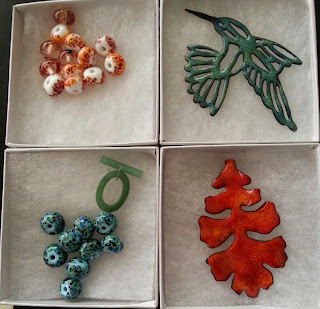 Check back to see what I do with the enameled leaf and the remainder of the lampwork beads! So many beautiful beads, so little time! I think I'm the last of my bead group (Ladies of the Evening)to get mine revealed. Take a look at their blogs as you continue to hop the blogs: Catherine King (who revealed at Mid-night!) and Deborah Apodaca. Well I made it before mid-night! My daughter's wi-fi is back up and running! Lovely! What a wonderful necklace. I like what you created with the hummingbird piece. Nice use of the chainmaile. Great soup! Love the hummingbird necklace! You did a great job! OMG -- you really got the asymmetry down! Perfect positioning of the large stone and the bird! I love their work -- it's awesome, and you did a terrific job! Thank you! Genny - mom and I are in awe in what you created with the beads and pendants we sent you! 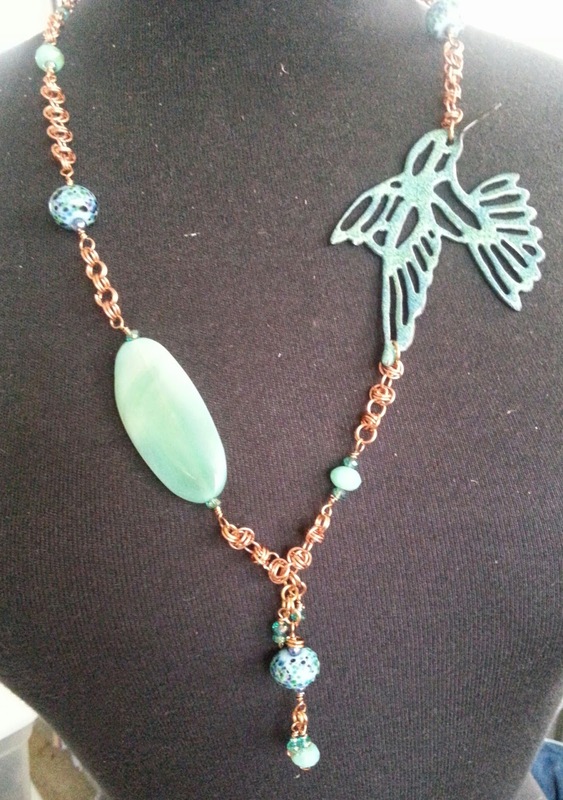 We both love what you did with the hummingbird pendant - we think you nailed it with the chainmaille and the asymmetry! Truly amazing! We both love the blue of the bracelet and that you made your own ear wires to make the earrings! We also love what you did for the leave earrings - using two of the different lampwork beads - ingenious! Thanks for being an awesome partner for our Bead Soup journey this time around! I love the hummingbird necklace. So cute sitting on your shoulder. Great soup! Love the hummingbird piece and the earrings!!!! Your leaves are gorgeous and the lampwork beads look like they were made for them! Can't wait to see them on Thursday!!! All of your pieces are fabulous. Love the hummingbird necklace and its asymmetry. I know how you feel with the asymmetry but you have nailed it. The balance between the large stone focal and the pretty humming bird is perfect. Love....love....love the Hummingbird necklace Genny. Everything just works and the Lampwork is gorgeous. Can't wait to see them up close Thursday. Oh your hummingbird necklace is stunning!!! Great job going asymmetric : ) Love your bracelet and earrings too. Lovely pieces from a fantastic Soup!!! That hummingbird is gorgeous!! The chain maille and the light green stone are the perfect compliment to the hummingbird focal. It is such a nice necklace. All of your work looks great. Nice job on the fold formed leaves too! The necklace you've designed is stunning. 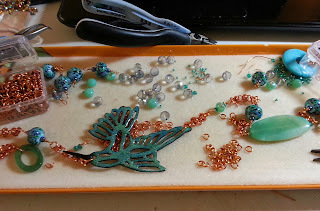 You've chosen the right beads to be used with the gorgeous hummingbird, the chainmaille and the assymetry are perfect. You embraced the asymmetry challenge and there it is - a beautiful necklace! Great colors and design on the blue bracelet. 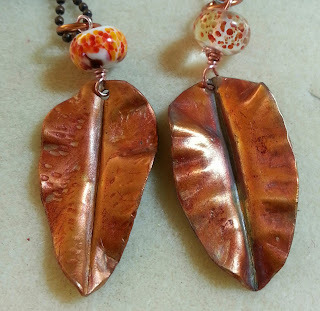 And I love the choice of the beads for the copper leaf earrings! Lovely soup and lovely jewelry! 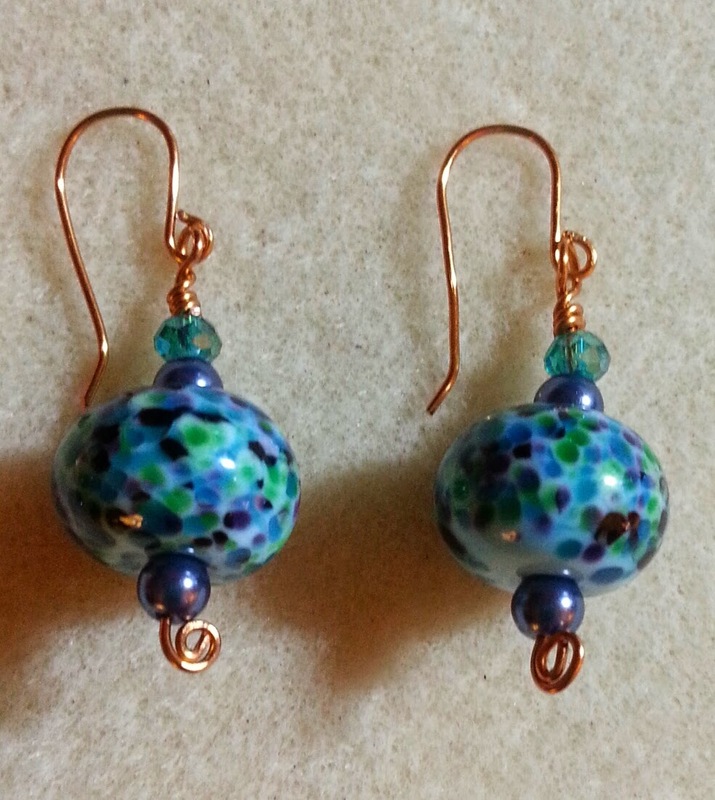 I really like the earrings with the bluish lampwork glass. Beautiful work! My favourite is the hummingbird necklace too. Leaf earrings are so beautiful! I adore that hummingbird necklace! Very nice pieces. I love the necklace with the bird and love the copper earrings. Great job! The hummingbird necklace is stunning! I wish I had the courage to play with asymmetry. Great work with your soup. The bracelet and earrings are wonderful. The asymmetric design on the necklace is perfect. You bracelet is delightful! I love the shimmeriness of the cube beads....so BEAUTIFUL! I like the chainmaille piece too, and it took me a minute to figure out the configuration of the bird. =) Beautiful pieces - you should be proud! Your bead soup results are great. Love your use of the hummingbird. Those copper earrings with the orange lampwork are wonderful. Beautiful. You did a great job with the humming bird....and the asymmetry worked well. Great soup! Beautiful soup, beautifully designed jewellery! Must be a pleasure to wear (-: great job! Sp pretty! Really Soup-er! Yep I'm still hopping! Don't want to miss a thing! The hummingbird necklace is lovely and I have to smile at the 'bluebird on my shoulder' bit. I think my favorite are the copper leaves with the orange beads. Terrific! Lovin the fold formed leaf earrings! Great soup!